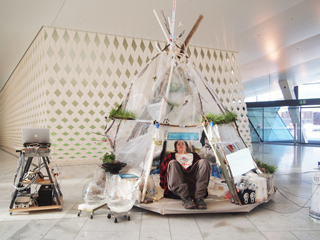 Hut#6: MiniBo was a collaborative interdisciplinary project created by jill sigman/thinkdance, Kristin Norderval and Amund Sveen that explored themes of sustainability and waste, home, real estate, survival, civilization, and man-made “nature”. Norderval, Sigman, and Sveen along with guest artist Vigdis Storsveen and additional invited participants, made themselves “at home” at the Norwegian Opera House foyer with a durational performance-installation that mixed dance, new music, visual installation, and live art. Their performance squat revolved around Hut #6, a temporary structure built of found materials and plants. Through activities like dancing, planting, cooking, and serving tea, they explored the concept of being “at home” and asked what home will be like when we have less energy and more trash. Envisioned as both an installation and a focus for the live performances, the visual centerpiece for this work was a hut-like structure built by Jill Sigman out of found materials and throwaways. It served as an impermanent and permeable home for several ongoing human powered sound installations, and for the durational live performances scheduled for five consecutive days during the period of the installation. Juxtaposing high technology and scrap, the installation was created specifically for the location where it was presented, using found objects and garbage from that area. Hut#6: MiniBo included two mobile battery-powered sound systems designed by Norderval and Sveen. Each station was operated, played on, and moved about in the space independently by the two musicians. After each performance, the batteries were charged by solar and wind power in a custom designed solar and wind charging station installed outside the Opera house. A hand-crank-powered sound installation designed by Kristin Norderval and a video installation triggered by pedal-power designed by Amund Sveen were available for public use during opening hours, and an additional sound installation created by Norderval was installed inside Sigman’s hut. The daily performances included live electro-acoustic music, video projections, durational movement, text, and interactivity with the audience. Highlighting the world of surreal contrasts that we now inhabit, where some people are drowning in the debris of over-consumption, and others are literally surviving on garbage and living in rubble, Hut#6: MiniBo focused on the questions of home and sustainability on a very personal level. Hut #6 is part of Jill Sigman’s The Hut Project and continues Sigman and Norderval’s past collaborations with portable performance and green energy.